So five gold rings. Maybe Goldschlager? No. What are we, undergrads doing shots to get loaded? Ok, ok. How about that terrible (terrible!) Hungarian Golden Pear liqueur? NO! Look, we want this too be classy. We only have 12 days in this calendar - no joke cocktails. Oh, how about that really interesting Chrysanthemum and Honey liqueur? That's kind of gold. Combine all ingredients over ice in a cocktail shaker. Shake until super-cold. Strain into martini glass. Express a bit of lemon oil from the twist onto the drink. 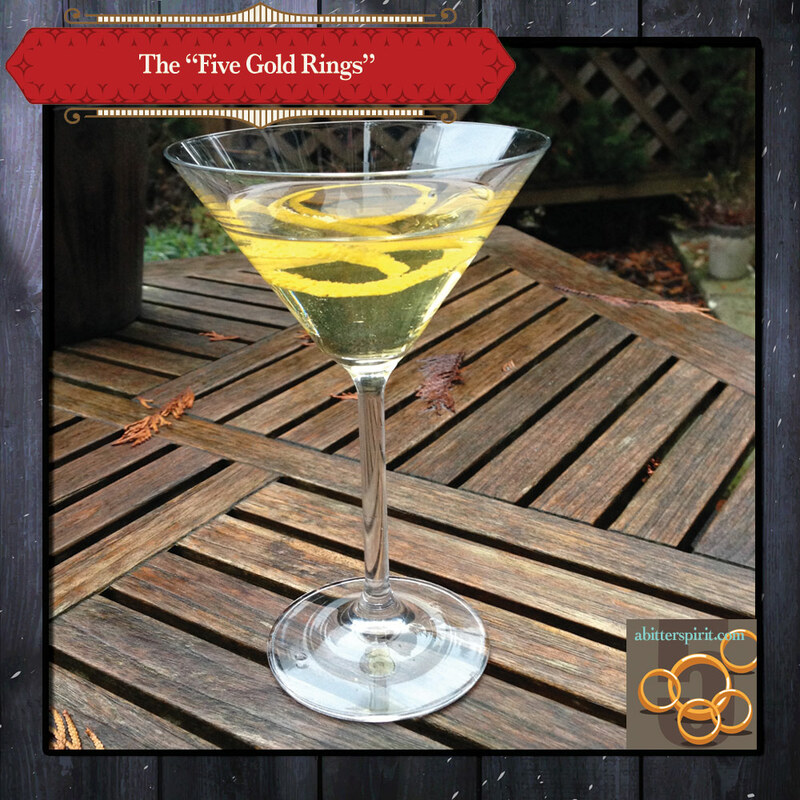 Garnish with fancy lemon peel rings. This came together beautifully. Amazing. Fresh. A little sweet. Needs the lemon. Drew and I are a nerdy pair. When we were researching the twelve days of Christmas (the lyrics of the carol, the various feast days, etc.) we came across a lot of interesting (and historically questionable) tidbits. But one of my absolute favourite things is the lyric comparison chart in Wikipedia. I always figured that "gold rings" vs "golden rings" was the most contentious lyric. Not so. Apparently, it is the one from today, Day 4. The original 1790 version of this carol listed the Day 4 gift as "4 Colly Birds". Colly is, it seems, an English regional colloquialism for black. So these should be four black birds. 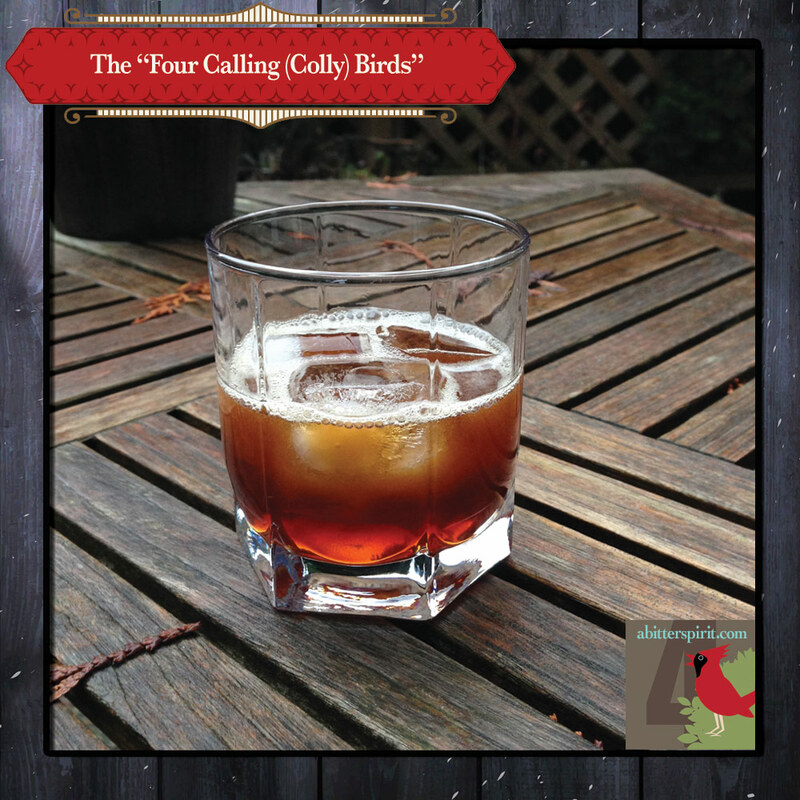 (Sidenote: there are also lyric variants of Canary, Colour'd, and Calling ... so black may not be definitive, but that's what we're going with for this cocktail). Upon reading this, I immediately thought "Black Russian" (possibly because I don't always have a lot of imagination). But then I remembered the challenge my wife, Rose, gave us at the outset, "Why don't you guys try using up some of the liquors you have before buying a bunch of new ones." Indeed. Here was the perfect opportunity to try to use some Root. Root is this very interesting spirit that calls up notes of sassafras, birch bark and, well, root beer. As you can imagine, it's tricky in a cocktail. This seemed like a fun one to try. Combine all ingredients over ice in a cocktail shaker. Shake. Pour over ice in a rocks glass. Serve. The Fernet Branca really makes this. It takes that last edge of sweet off of everything and makes this a nice, grownup drink. We also tried Whiskey Bitters. They brought up a wintergreen flavour which was tasty, but not what we were going for here. 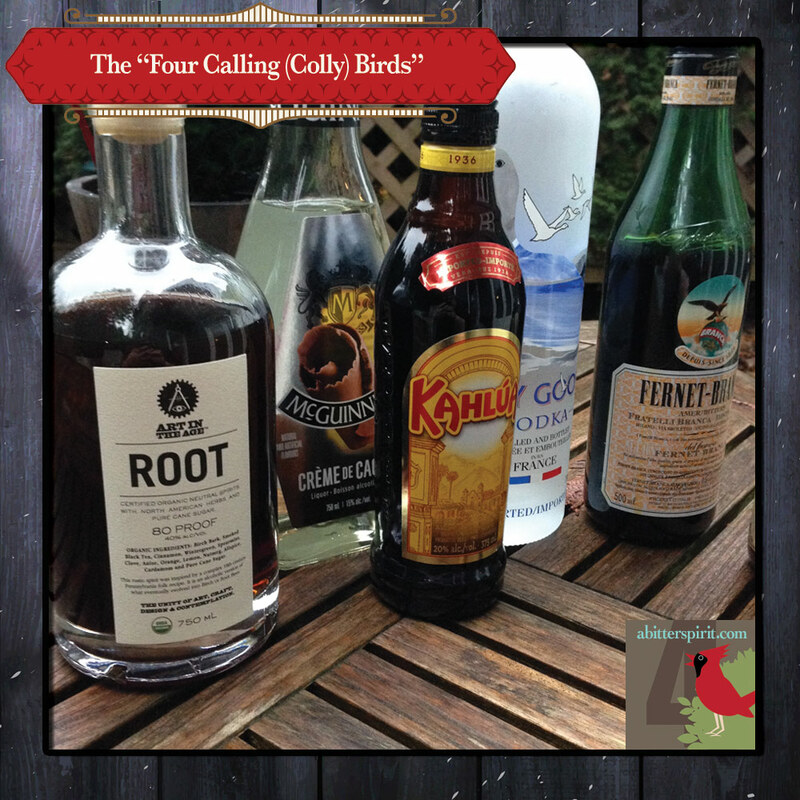 Well, we're into Day 14 of this year's cocktail Advent calendar. We've completed our celebration of Mary and have moved into our Week 3 theme: Spirit of the Season. This is nice and vague and covers anything from Christmas greetings to holiday activities. 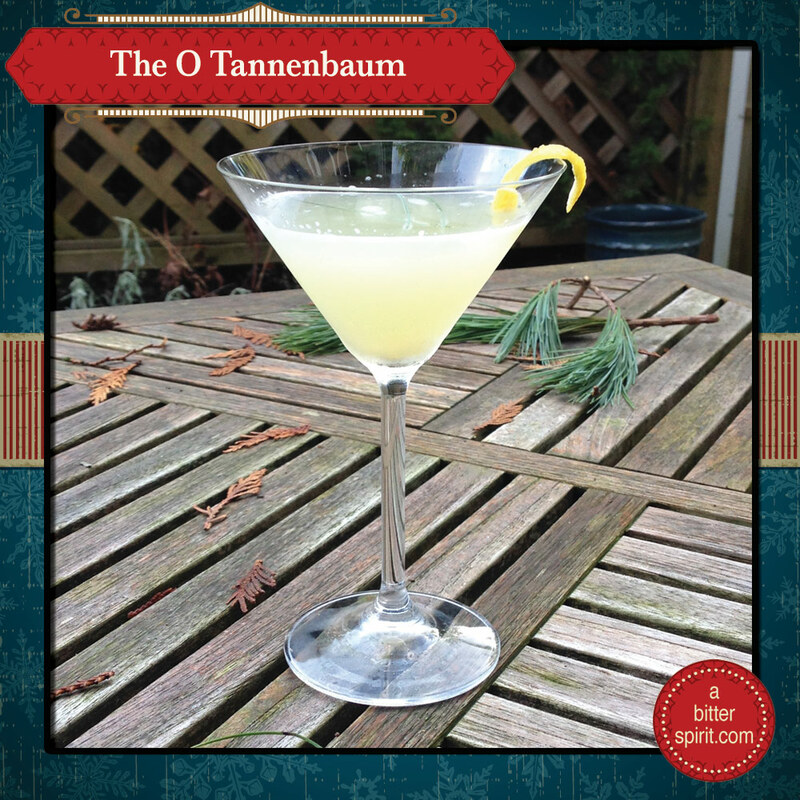 So we're starting off with the most iconic Spirit of the Season carol we could think of: O Tannenbaum. The melody for O Tannenbaum (German for "O Christmas Tree") is a 16th century folk song. 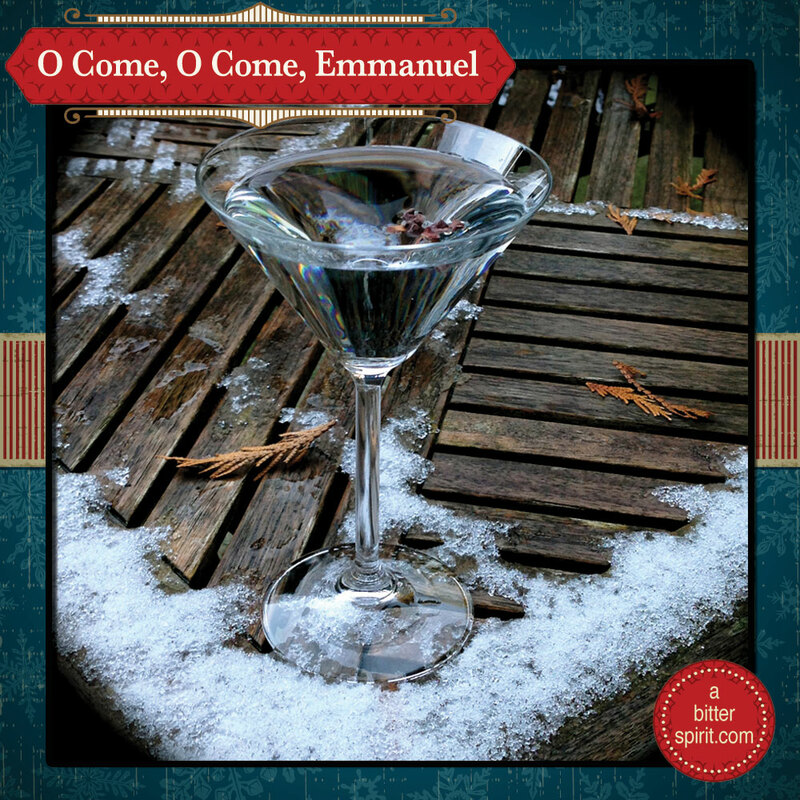 In the mid-1800's, the modern lyrics first appeared as a tragic love song but were then transformed into the carol we know when composer Ernst Anschütz added a few verses about the faithfulness of the evergreen. Christmas trees were also becoming more popular at this time, so the carol ultimately lost its melancholy origins and became a song of holiday celebration. Muddle chopped pear in cocktail shaker. Add vodka, fir liqueur, rose hip syrup, and bitters. Shake over ice. Double strain into cocktail glass. We have to admit, we lucked out a bit this year. 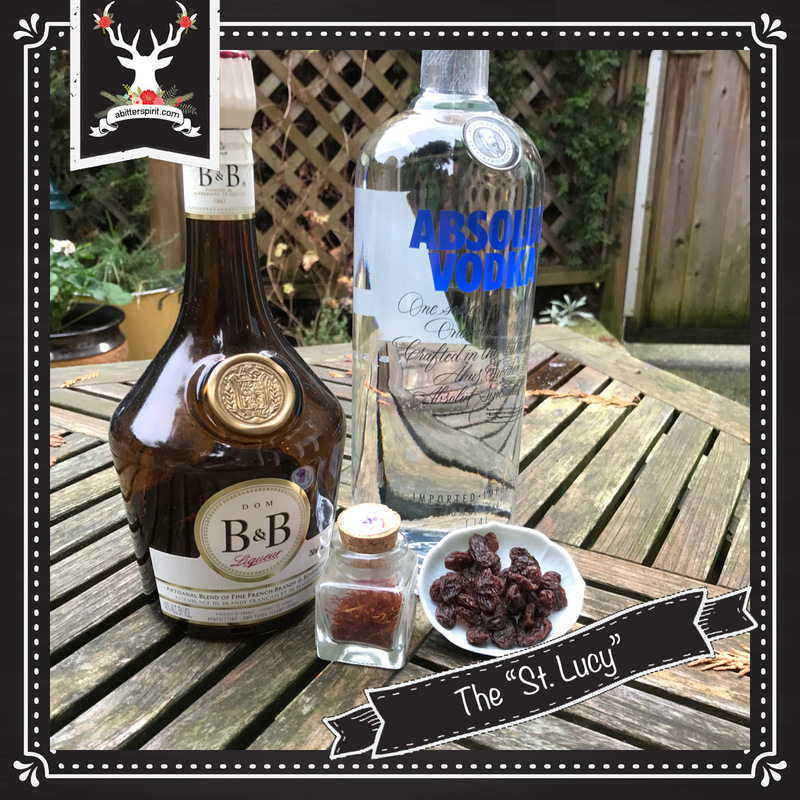 A lot of the holiday drinks we are seeing are using fir infusions or fir liqueurs. We've been planning these drinks since October, so we like to think we're ahead of the curve when Kate said back around Canadian Thanksgiving "Must. Have. 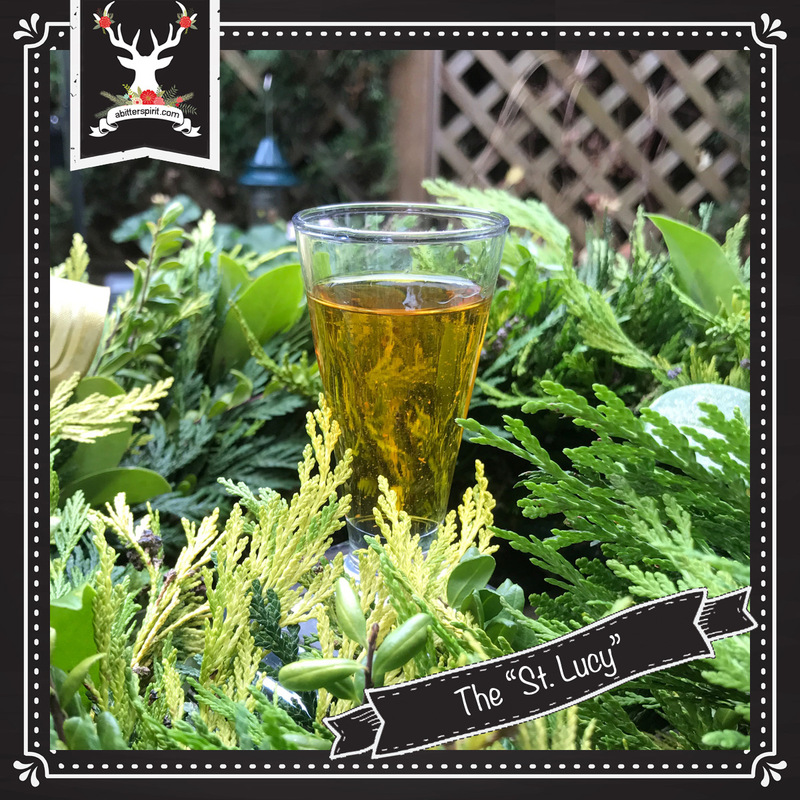 Douglas Fir Liqueur." We're SO "on trend". 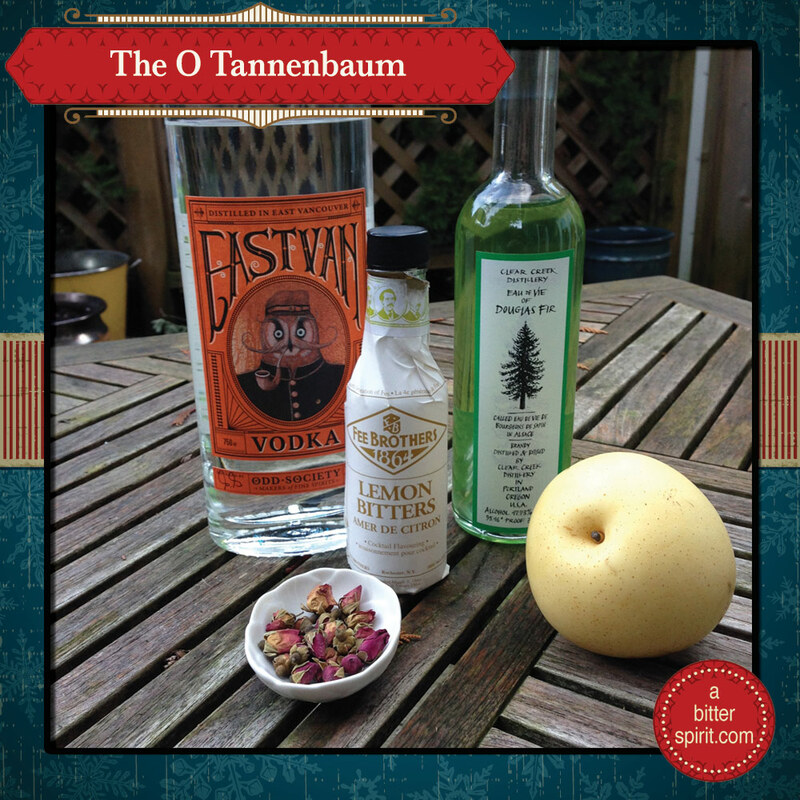 For this drink, we initially considered a nice botanical gin, but then we tried the East Van Vodka from Odd Society and realized it would be a great fit. The East Van Vodka isn't tasteless, but lightly fragrant, reminding us of a high-quality sake. It enhances the fir and the rose hip flavours. Sometimes, you want some festive German family from the mid-eighties singing you a Christmas carol. You're welcome. Well it's our final cocktail today. Can you flipping believe it? We can't believe this is the end. Thanks to all of you for following along with us as we went about this project. Hopefully, you enjoyed the journey as well as found inspiration and a little mirth. And with that, it's Christmas Eve, so let's get to it! The final cocktail is based on the final Magi, Melchior. Tradition holds that Melchior's gift to Jesus and his family was gold. Given that, we wanted to make a gold colour cocktail with some echoes of Middle Eastern spice. We decided to infuse some vodka with chai tea and combine that with ginger liquer to heighten the spice profile and some pear liqueur to sweeten it and give it a golden colour. Combine the powdered ginger and sugar in a bowl. Moisten the rim of the cocktail glass with water and coat it with the ginger and sugar mixture. Pour the vodka, ginger liqueur and pear liqueur into a cocktail shaker with ice. Shake until chilled and pour into the rimmed glass. Top with five drops of the bitters. To make chai infused vodka, put one chai tea bag into a cup of vodka and let it steep for 2 hours. Bittered Sling Moondog Bitters - Pretty good. Bittered Sling Lem-Marrakesh Bitters - YES! Bittered Sling Denman Bitters - Again, pretty good, but not realising the full potential of the drink. Bittered Sling Plum & Rootbeer Bitters - No. Flattens out to nuances and emphasizes the sweet. Coster's Blackstrap Ginger Bitters - nice and ginger-y, but not perfect. 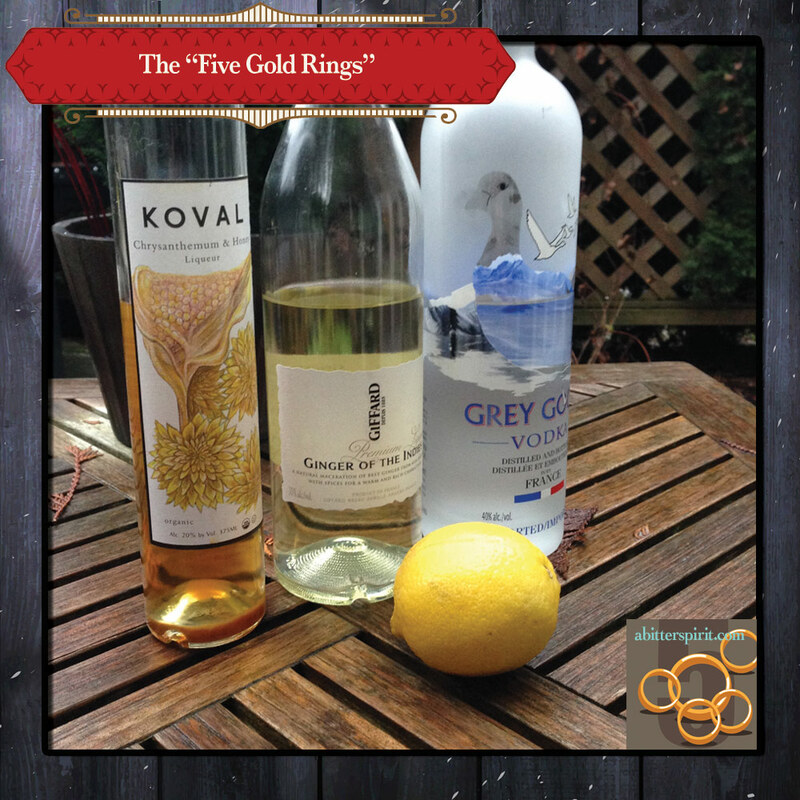 Our Melchior got its start with this cocktail published in Marie Claire - the Winter Wonderland. The chai-infused vodka and pear liqueur combo really spoke to us, but we had some deep reservations about the creme de menthe. So we swapped that for ginger (which is a little more "Far Eastern") and made a few other tweaks (including bitters) to arrive at our Melchior. 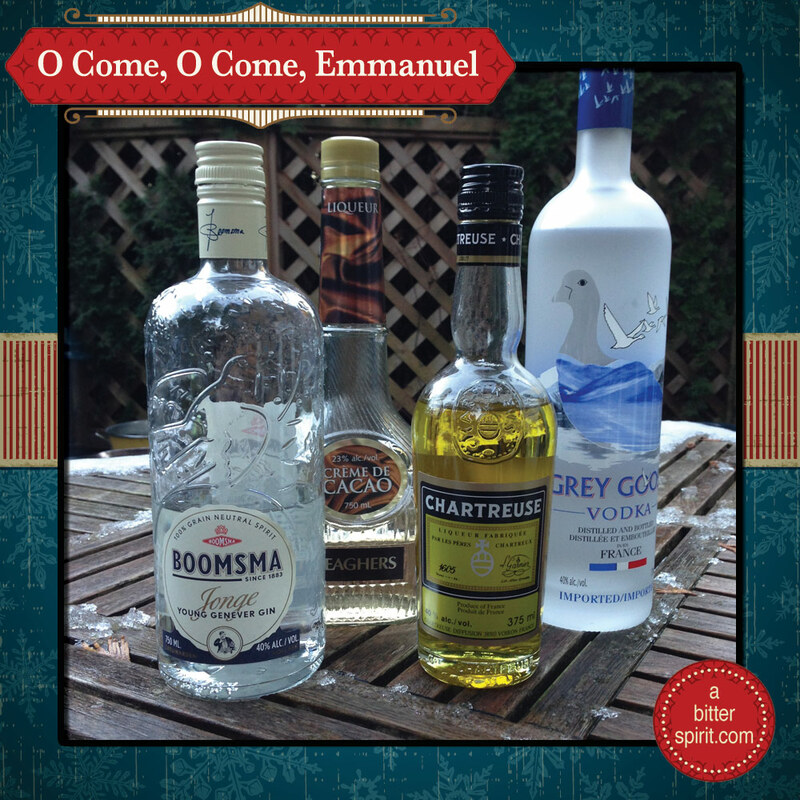 You knew it was coming … we have one more version of "We Three Kings" that we wanted to share. This time, the incomparable Ella Fitzgerald. For the next three days, we’re focusing on the three main spirits (no pun intended!) of A Christmas Carol, those being the Ghosts of Christmas Past, Christmas Present and Christmas Yet to Come. We thought it would be fun to take one type of cocktail and make three versions of it, one from the past (or a classic form of it), one from the present (or how it has been morphed into a contemporary cocktail) and one as it might be envisioned in the future. The base cocktail we decided to go with is a martini. It’s classic and yet extremely versatile. The past decade has seen an explosion of variations on a martini with some incredibly imaginative and delicious cocktails have come out of it. How do you solve a problem like Hermey? You know, Hermey. The misfit elf from Rudolph the Red Nosed Reindeer? Anyway...here’s a man, er, elf who doesn’t like his job and clearly cares more about his hair than his fellow elves do. And haven’t we all been in his shoes? That’s probably why we can relate to Hermey so well. We’ve all been that guy at some point in our lives. Elizabeth has Mr. Darcy. Ron has Hermoine. Katniss has both Peeta and Gale. And Rudolph has Clarice (and we're not talking about Jody Foster in Silence of the Lambs either!). Clarice is the fetching doe who doesn’t care that Rudolph’s honker is bright red beacon. She even defies her parents' orders and joins the search party for her crimson-beaked beau. For that, she definitely earns a place on Santa’s Nice List and a spot on our advent calendar. You’re a mean one, Mr. Grinch...For over 50 years, the story of the Grinch has been a part of Christmas. Jealous of the Whos, the Grinch (with his loyal dog Max in tow) set about stealing their Christmas. But Christmas morning, as the presentless Whos joyfully sing, the Grinch realizes that there is more to Christmas than just presents and his heart famously grows three sizes.